Miss Becky Boo: Oh my is it holidays again?? Oh my is it holidays again?? Is this the time I only seem to blog in now? Come back in 3 years when I've finished my degree... Anyway hello bloggy babes. Once again I have been surrounded by 3 to 4 year old children, assignments, classmates, my boy, settling in to my new church and just living week by week in this economy. It is OCTOBER people! Where did the year go? I've found this year a be of a struggle keeping the fires burning with the LORD, getting motivated to study, parenting on empty and trying to keep my wits about me. I will say that God is good and I am human. In my memory I have a list of scripture that live in my brain and I bring out when I'm feeling low. Thank you LORD that you plans for me are for good not evil, that if I seek you I will be found by You. No weapon formed against me shall proser. I am your child, adopted in to your family, a princess of the Almighty King. I have your favour as a shield. You will never leave me nor forsake me. You who started this good work in me will finished it. I wear your armour, You have cast my sins in to the sea of forgetfulness. You turn all things for good. All things are possible with you. You are my LORD, my God, My King. I love you Jesus. This is my morsel I need to eat to get through my day sometimes, it should be a staple though really aye. Anywho that is where I have been at. As for the holidays Ash has been hanging out with Master Paisley Jade today. He's staying over with us tonight. 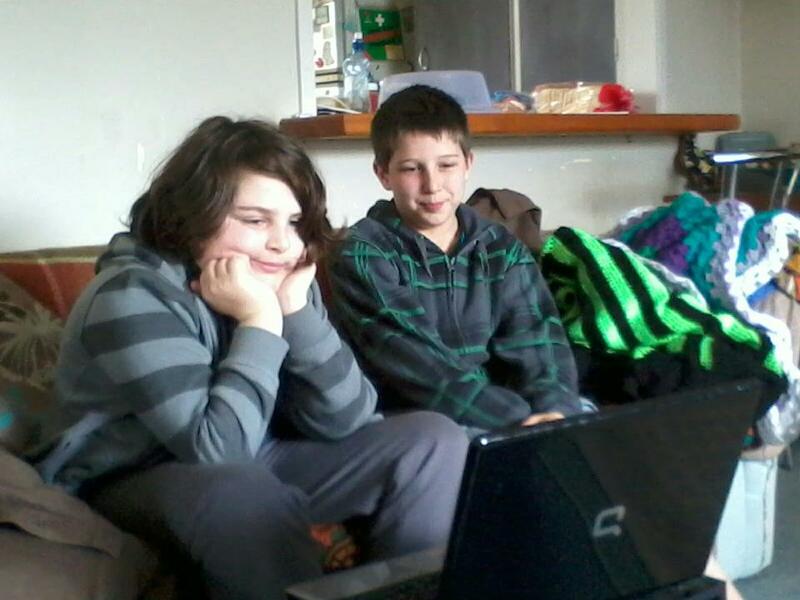 Would you believe these boys are really in to Doctor Who? Well actually it's no surprise to me. Our boys like technology and science fiction pretty much. At least they have weird parents who understand their interests! (Bit of a geek myself). Its good to have good mates, they keep you together when you fall apart and laugh at you and with you. I appreciate you my buddies and I appreciate Asher having a good mate like Mykah! Well perhaps I'll see y'all next holidays when all assignments have been handed in and Christmas presents hopefully bought and hidden. aw too cute. So cool that they are good friends.